In some templates like the Minima template, you can easily change the font type, font color and font size of the Blog Header, Title and Description. 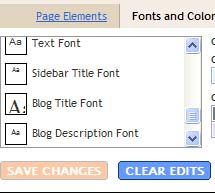 However, there is no option under Template -> Fonts and Colors to change the font properties within the Sidebar to make the text different from the rest of the Blog contents. To change the font, you will have to modify the template and add the font properties into the relevant part of the CSS stylesheet. To have the CSS font declaration in the Sidebar, go to Template -> Edit HTML. Scroll down the template to this selector and insert the font properties and values. In some templates, instead of .sidebar, you may see #sidebar or #side or variations of that. What you can do is to insert the font code and Preview the template. If the sidebar fonts are changed accordingly, you know you have inserted the code at the correct position. Try out other properties if you need to, such as making the font bold or in a different font face. I have learned so much from your blog. I was hopelessly ignorant before I found it. One thing I would like to do is change the font style of the title in my header. The font that I want is not one in the Blogger list. I can't find any explicit instructions for how to do this. Can you help? Can you help me to remove the overlapping effect from the post titles when the post title are long. hello!can i change the font style of my blog title to my own customized font? i love you for this tip! seriously! I too would like to know how to use other fonts from my computer.....blogger has boring fonts. Is it possible? Your tips are tops! Thanks for all your hard work to keep us bloggers happy! You are my American Idols! i have i question is this the only available fonts you can choose? Hey Jim, could you contact me at karlparrott@yahoo.com. Would like to hire you for some work. Same problem here, I want to change the font of my title to a different one, not from Blogger list... Can you help?